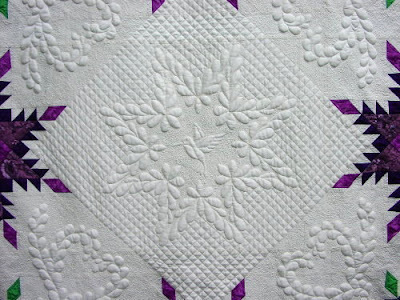 Jill Schumacher of California says that machine quilting is like learning to ride a bike. Isn't her quilting beautiful? She offers classes, workshops and retreats. For details visit Quiltmaker to the Queen. Jill has quilted more than 550 quilts! I love the hummingbird! That machine quilting is really spectacular! Wow!! Thank you for sharing so we could enjoy the beauty of it. Jill is an artist, that's for sure! I'm glad you know about her, Karen and I'm glad she knows about you. I have been fortunate to have attended two of her workshops through my guild. Jill is an excellent and very understanding teacher. She does make it look easy, it isn't.